There are plenty of ways to reach your target. Messaging just happens to be the most engaging. Think about it. When’s the last time you didn’t open a text message? Like, never opened it? Now think about all the unread emails in your inbox. That’s the difference. Plus, messaging is a new, owned channel for your brand, and they chat back and tell you exactly what they want. Conversational messaging uses machine learning and natural language processing to create an AI that really speaks to, and engages, your customers through SMS and app messaging. Imagine if you could just talk to a phone tree like you’re talking to a sales associate — scratch that — a normal human being. But Chatitive is so much more than that, it’s a one-stop-shop for comprehensive messaging campaign solutions. I’ve never used messaging in my marketing efforts. How do I get started? Our hands-on support model means that we will help you design a program that is right for your company and your brand. Our interactive communications channels allow us to work closely together to build the right strategy, functionality, messaging, and campaigns to help you achieve, and exceed, your marketing goals. I know about messaging platforms/services. What makes Chatitive different? 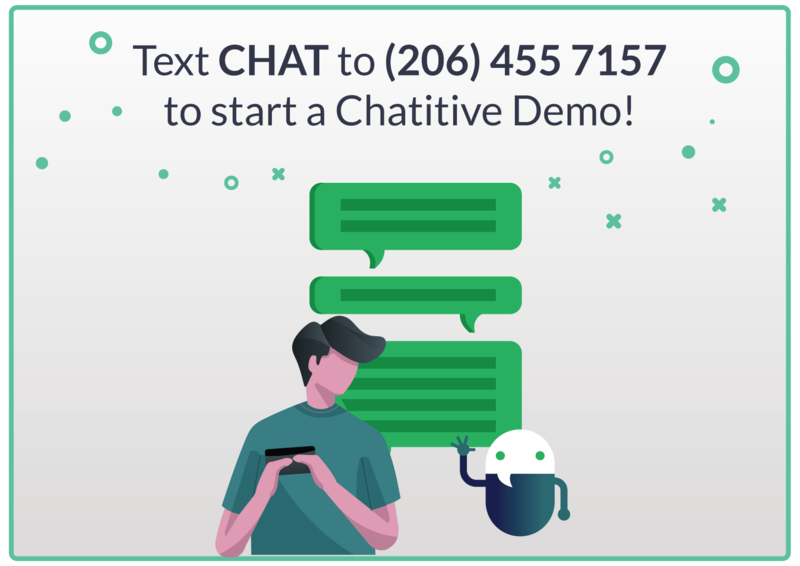 We already use chatbots, how is Chatitive different? Many chatbots are set up as a “black box” meant to work in siloed ways. The Chatitive platform works fully with all of your systems. We integrate with your existing business rules, or we can help you create new ones. Our conversation is natural and truly… well, conversational. It’s not like a phone tree with routine or mechanical responses, we have the ability to create realistic and familiar language for your chats. We bring messaging and bot technology plus smart communications to allow you to scale your messaging programs in the moment. How can I use Chatitive for Growth Marketing? Chatitive can easily be set up to build and grow your customer base. Send out messages to encourage sign-ups and onboarding. Then create campaigns to learn more detail about your customers’ preferences and habits, so that offers and incentives are relevant, useful and engaging. How can I use Chatitive for Loyalty Marketing? Use our platform to create custom communications for your most active and loyal VIPs. Send them special offers, give them sneak peaks of upcoming sales and events, and target personalized offers to your most effective customer base. How can I use Chatitive for Customer Support? The Chatitive platform can be an effective tool to service your customers’ support needs. Create conversations based on common use cases for effective and efficient support. Plus, Chatitive seamlessly integrates into your existing CRM and Customer Support software, so you can track and manage activities. How are you different than CRM tools? Like CRMs, we offer event-driven, automated messaging campaigns for your customers. But we take it a big step further. We help you to speak with your customers beyond events, at any time in the customer journey, really. Also, your customers can chat back to tell you what they want, when, and why. You also get access to conversational history and records between our platform and your current CRM system. I don’t have my customer’s phone numbers; how can I use Chatitive? We’ll help you build programs and tools to collect mobile numbers from your customers so they can start receiving messages from you right away. Is there really no development or IT required to use Chatitive? Yes. Really. You could use our platform today to send out a customized messaging campaign without using any technical resources. Depending upon how your current tools are set up, you might need light IT support to ensure full integration with existing platforms or data. We’re all about hands-on technical support — you and your teams will be able to start as quickly as possible. How do you integrate into my existing tools and systems? We’ve built documented, API-level connections to “plug in” to CRM software, analytics tools, customer service platforms and more. Just let us know what you’re using, and we’ll help you make the connection. Also, if you have existing data in other systems, we’ll make it easy for you to upload or transfer that information into the Chatitive platform. Do I need to worry about privacy or compliance? We work with you to ensure that your campaigns meet current legal, technical privacy, and compliance requirements. We can provide guidance on language for your campaigns, and can create automated terms to comply with standard regulations. We also make sure your messages aren’t blocked from reaching their intended recipients and manage unsubscribe requests. Have more questions? let's chat.